The Elk Rut Is In Full Swing! During the rut, bulls (male elk) become aggressively protective of their harems (groups of female elk, or “cows”). When two bulls find themselves in the same region, they may compete for a harem of cows. After a bull signals that an intruding bull is too close for comfort, the two bulls may enter into a melee. During this fierce skirmish, two bulls will smash antlers, using all their might to show their strength. Now, fortunately, this is only a display of strength—while bulls can get hurt, it’s not a fight to the death. Bulls act very strange during the rut. On top of butting heads with the competition, bulls will often rub against trees, tear up grass, and cover themselves in mud and urine (urine serves as a musk to attract cows). As a result, bulls look very imposing; plus, this ritual is intended to display power—which deters other bulls while attracting cows. A Friendly Reminder: Stay Safe! 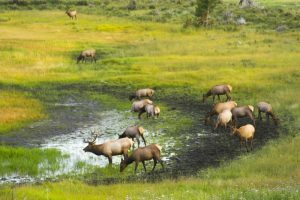 If you can’t make it to the elk rut this year, there’s always time to catch this glorious ritual next year. Don’t miss out! Take a moment to book a cabin here at Rams Horn Village for the coming year. At our Estes Park resort, we have a number of luxury cabins that are perfectly set here in Estes Valley near Rocky Mountain National Park. In fact, we’re so close to RMNP that it’s not rare to see elk right here on the property! 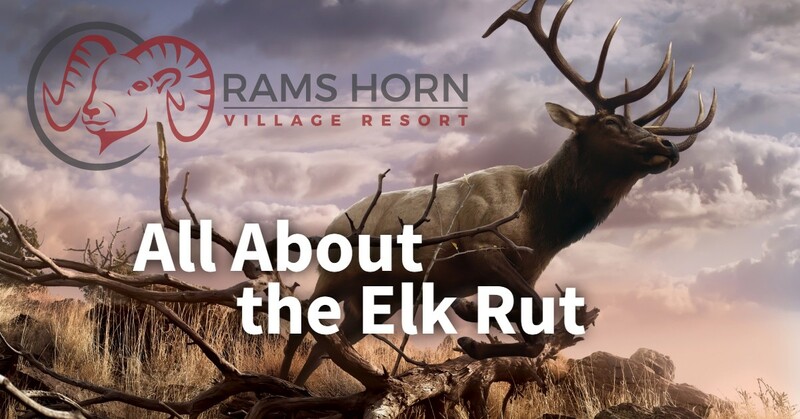 So, for an up-close look at some of the most majestic creatures in the Rockies, have a stay with us at Rams Horn!